Someone 3D printed a contraption to hold some Switch games and, more importantly, the strap attachments for their Switch’s Joy-Con controllers, creating something I didn’t know I needed until now. The Joy-Con are great for playing local multiplayer but also terrible for playing local multiplayer. As nice as it is to be able to boot up Mario Kart 8 Deluxe on a roof top with all my friends just like in the commercial, it’s hard to be at your best while clutching a minuscule piece of plastic like a seagull that just made off with a bag of Spicy Sweet Chili Doritos. The Joy-Con straps are one way of addressing this, snapping onto the side of each Joy-Con to make them bulkier with bigger buttons to press on. There’s never a good place to store them whenever you’re just playing in normal handheld mode though. 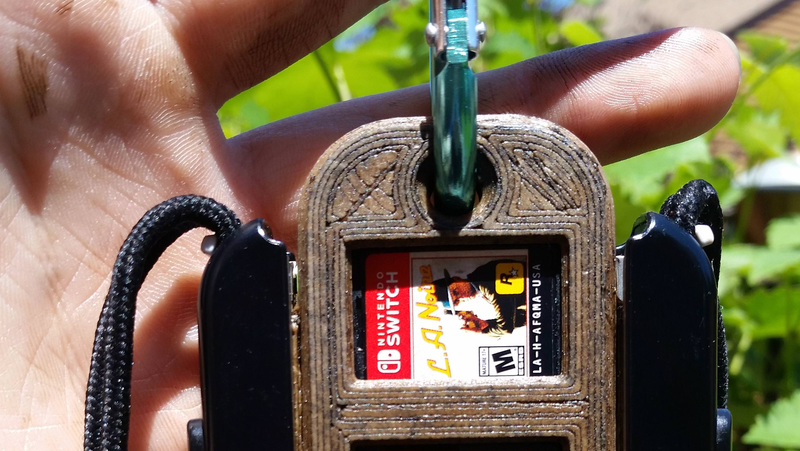 Enter Hunter62610 who got creative and made a small case for their Switch games that also has slots for holding the Joy-Con strap attachments, posting the results on Imgur. They used woodfill as the 3D printing material so while it looks like cardboard when it first comes out it can be stained to look more sophisticated (quite good in my opinion based on the pictures) and is sturdy enough according to Hunter. The two pieces snap together and also include a caribener hole in case you ever want to take your collection rock climbing. You can see more pictures and further details about the DIY project over on Imgur.